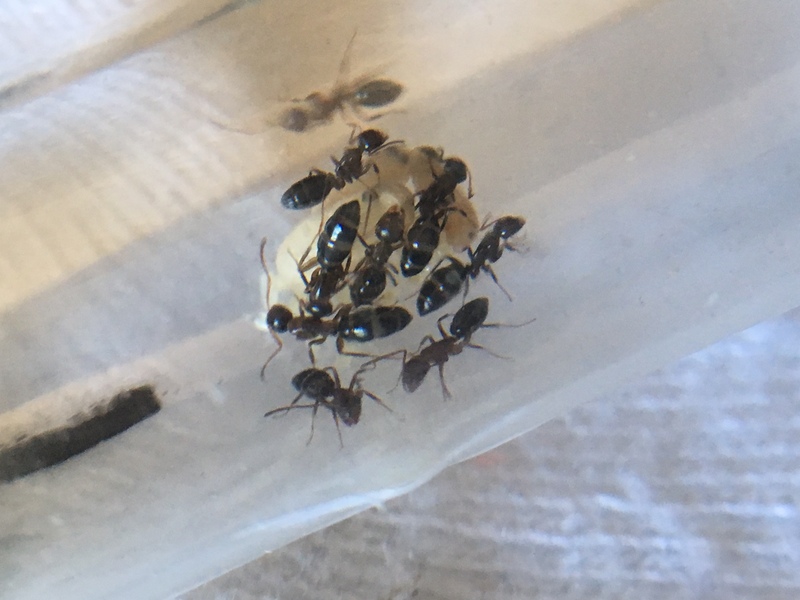 So I've decided that I'm going to start a journal to document the progress of my Camponotus hyatti colony and how to care for them since no one else on the entire internet, from what I could find, has before. They should be kept in 80-85 degree Fahrenheit temperatures. They eat mealworms, fruit flies, dead mosquitos, small moths, and maybe spiders, as their protein food source. For their sugar source, they can consume small drops of honey, sugar water, honey water, and byFormica SUNBURST AntNectar(Haven't tried it but that what the GAN Farmer used). Their nest should be completely dry and they should get their water from a test tube in the outworld when they're out of the test tube setup stage. Not the best picture I know lol. This is my first colony. I got them from a GAN farmer in West Sacramento on June 24th.They had 5 workers when I purchased them, now they have 6. I started out feeding them small frozen moths, with the head separated, and the body cut in half and small drops of honey. I used a bug zapper to obtain the moths. Since I'm 15 and my parents are separated, I have to stay at my mom's one week then my dad's the next. I keep them at my mom's and on the last day, I just feed them a week's worth of food. Last week was the first week I was gone from them. I gave them two large moths and one small moth. When I got back today is when I found that I had a new worker. Today I just started feeding them small, live mealworms from PetSmart with the head cut off and the body cut in half. I only give them the body. For sugar, I give them a small cotton ball soaked with honey water on a piece of tin foil so they down get stuck and drown in the honey. I'll do this every day. 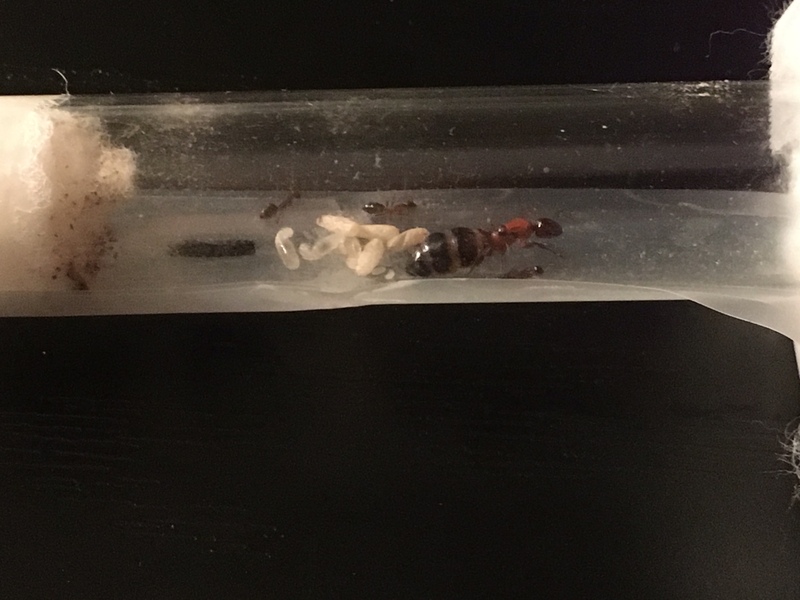 I made my own foraging area using a small plastic container and drilled a hole to connect the test tube and a hole on top and plugged it with cotton so they can breathe. 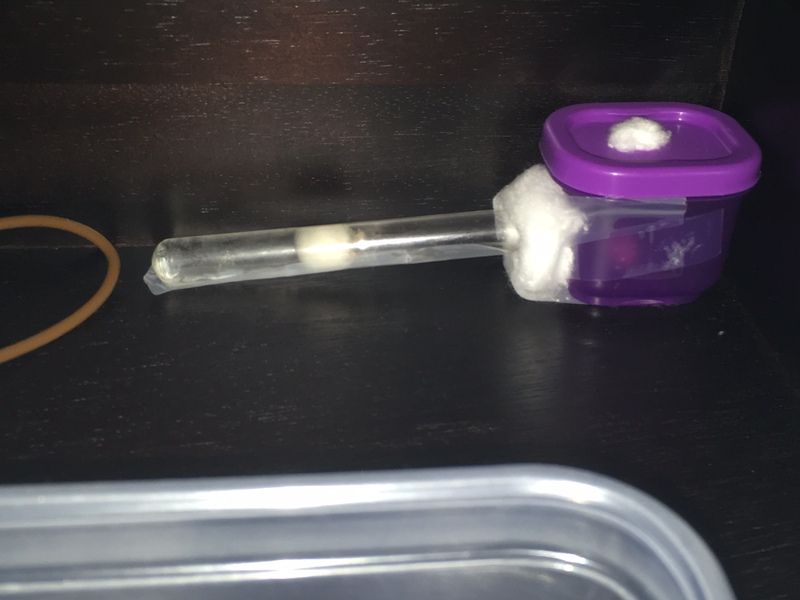 I had to surround the point where the test tube and container meet so the ants didn't escape. 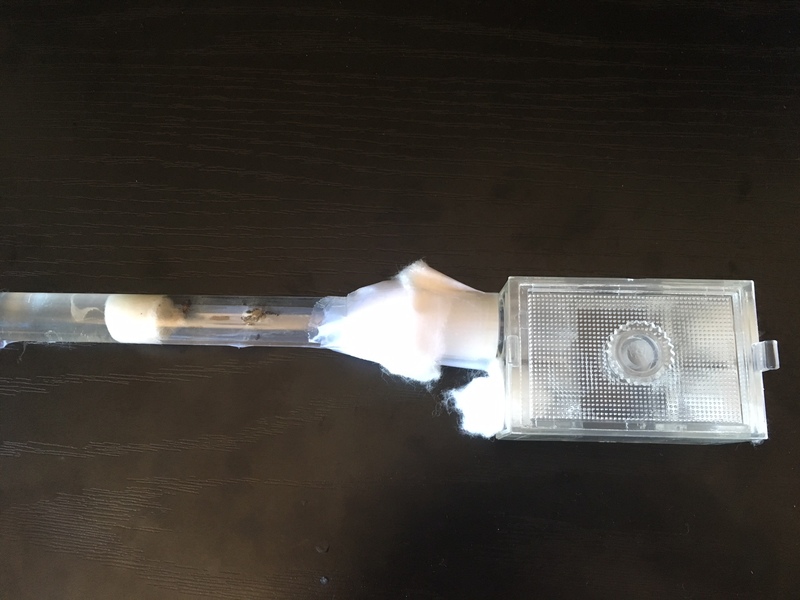 I put a bit of superglue on a strip of tape, attached the tape to the underside of the container, and glued the test tube to the tape so the test tube wouldn't move. This plastic container will serve as their foraging area until my AC Test Tube Portal arrives. I got a 15watt reptile heat cable from Amazon by a company called Zoo Med and put it close to the tip of the water portion of the test tube. For the barrier, I covered the upper half of the container and the underside of the lid with vaseline. I don't know if I'm supposed to replace the barrier every few days or not since I saw a worker climb up a little less than half the barrier then turned back. Maybe I'll add a new layer of vaseline tomorrow. I'm pretty sure this explains everything so far. I'm too tired to go back and spell check lol. I'll have more updates this week. Are you supposed to leave the heating cable on 24/7? 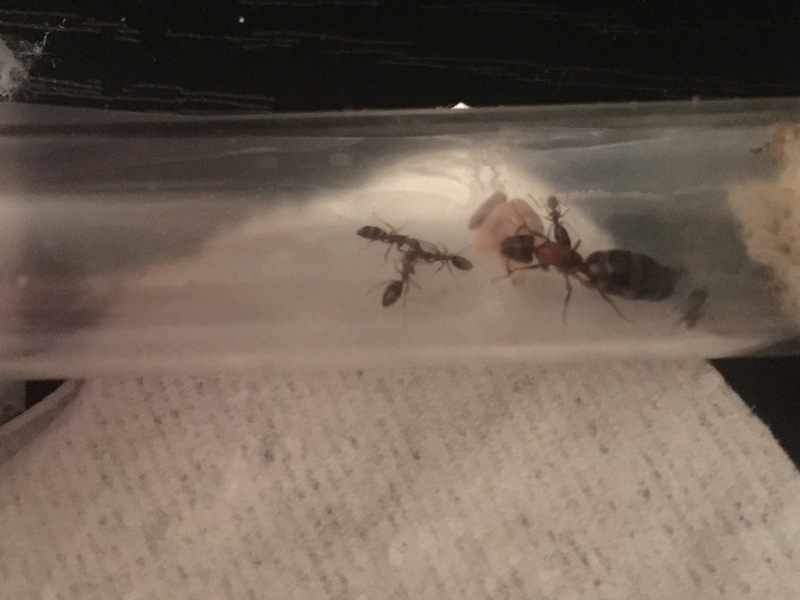 After I fed my colony last night I saw them performing trophallaxis. The thing is it was going three ways lol. Is this normal or something unordinary? I also just checked and now they have 7 workers. I was feeding them just moments ago, and I noticed that the entire colony was frozen. 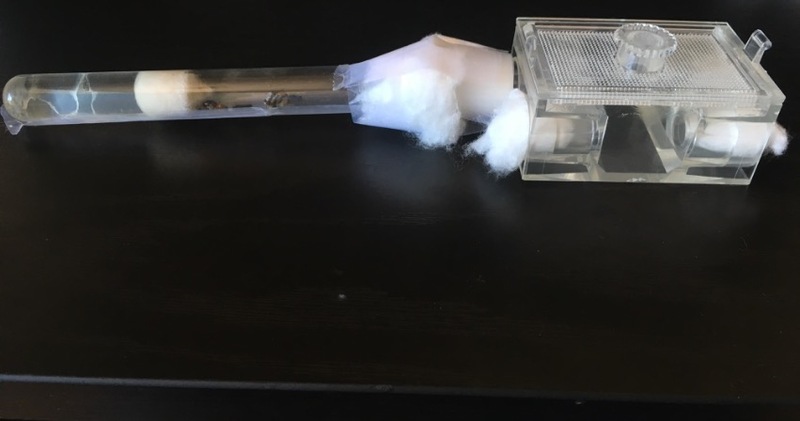 I put a piece of toilet paper on the test tube and kept it there for about 20 seconds. I could sorta peek under the toilet paper and could see they were moving again. I removed the toilet paper and they froze up again lol. They were perfectly still too. I guess my colony and/or species plays dead when faced with a threat. I never even knew ants could do that. So I got back to my colony today and saw that they have 10 workers now. 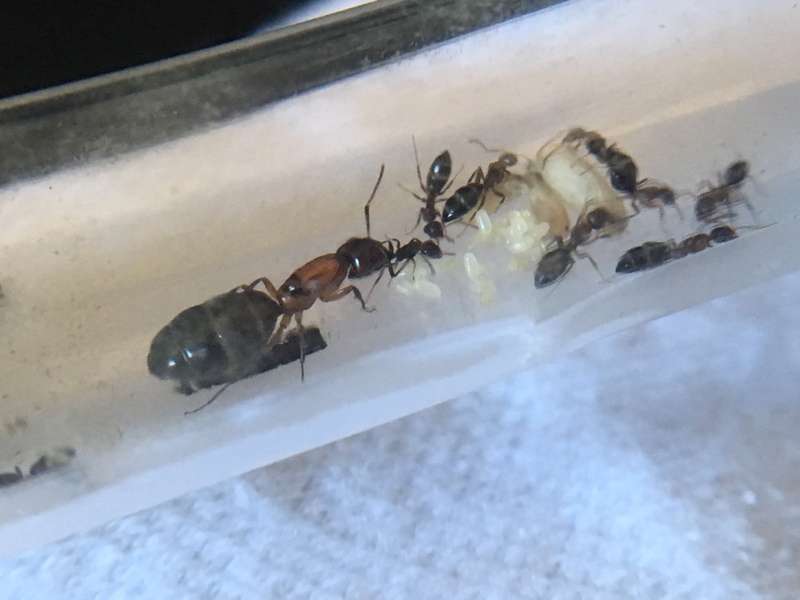 which means 3 workers hatched when I was gone. They have quite a lot of brood now too. I also moved them into the AC Test Tube Portal I ordered. I had to surround where the test tube and portal meet with cotton and tape since the test tube had a smaller diameter than the opening of the portal entrance. I'll feed them in a bit.